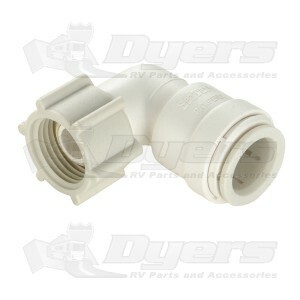 With just a snap, quickly install these fittings or valves on hot or cold water lines! Unique, patented, quick connection system significantly reduces installation labor without the need of special tools. High performance design allows for simple connections to PEX (plastic) CPVC, and copper tubing. FDA approved. Meet or exceed the RVIA standards. 35 Series products are manufactured in polysulfone and certified to NSF-61, NSF-14, CSA B137.5, ASTM F877, IGC 188-04c and recognized by the Uniform Plumbing Code. What a time saver.Just cut tubing square push fitting onto tubing and your done.Pressure checked because was way to easy.